An insurance customer in Rome, Italy, initiates a chat with a support representative in New York. 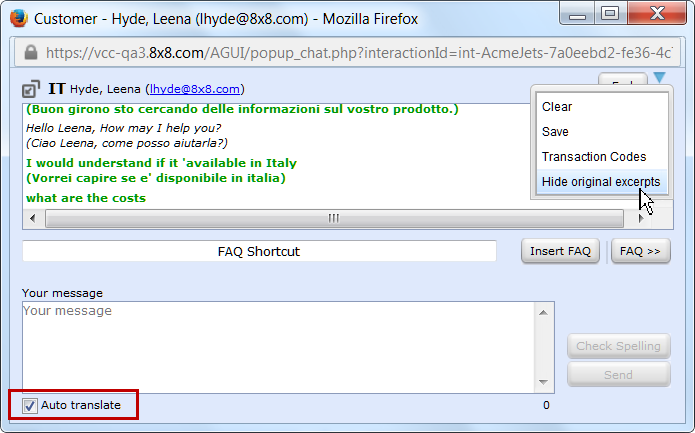 Using the automatic translation tool, the agent is able to handle the chat request in English while the customer uses his native Italian. 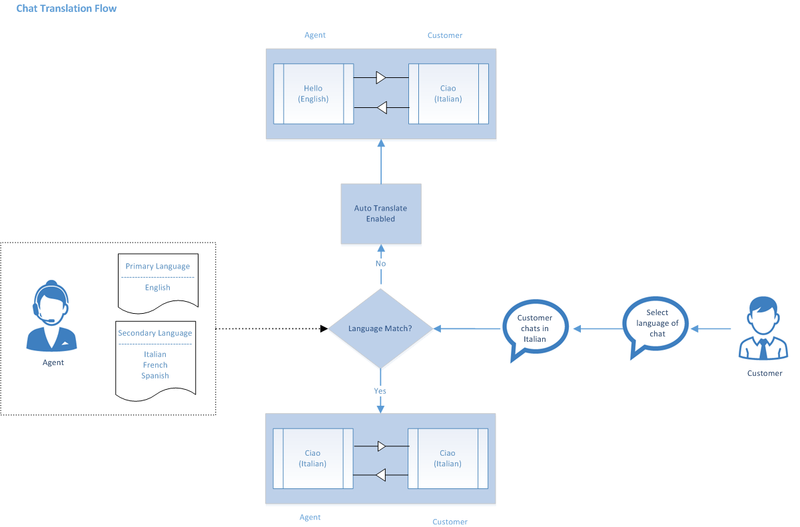 The tool translates chat conversations between customers and agents, giving them the flexibility to communicate in their respective native languages. If this chat is handled by an agent who happens to speak Italian, he can choose to handle the conversation without the aid of the translation tool. 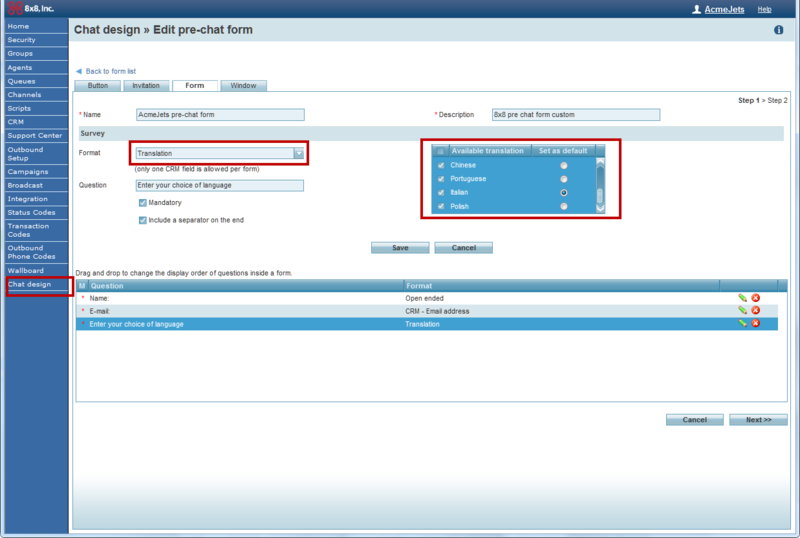 Virtual Contact Center now introduces multilingual support for chat. 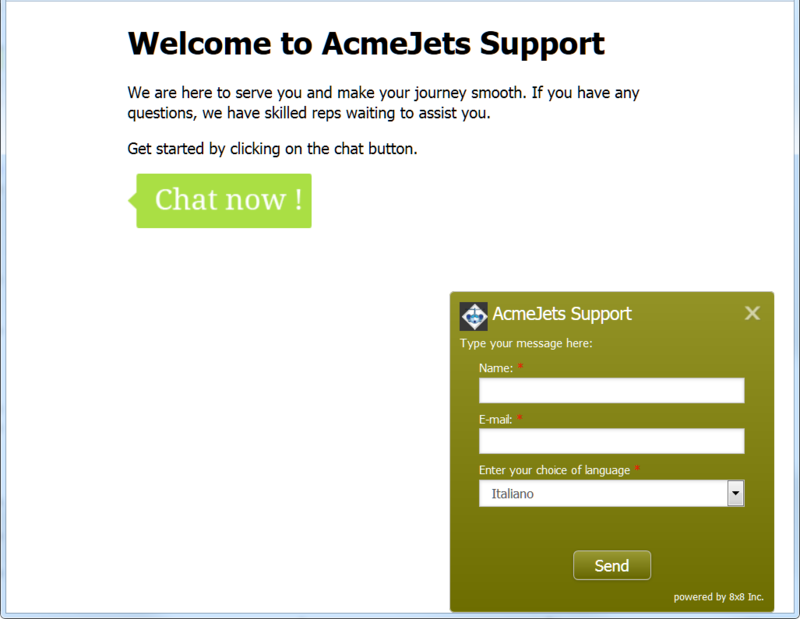 With this enhancement,customers can choose to chat in any of the supported languages. Agents can handle customer chats in any of the supported languages they speak or use automatic translation tool. Each Virtual Contact Center agent is associated with a primary and one or more secondary languages of fluency. If the chat request is in one of these languages, agents can chat in the requested language. If the chat request is not in their primary or secondary language, agents can use automatic translation tool. Administrators can provide language choice in embedded chat. Customers can choose to chat in a language of their choice. Agents can handle customer chats in any of the supported languages. Exclusion is not supported in this release. 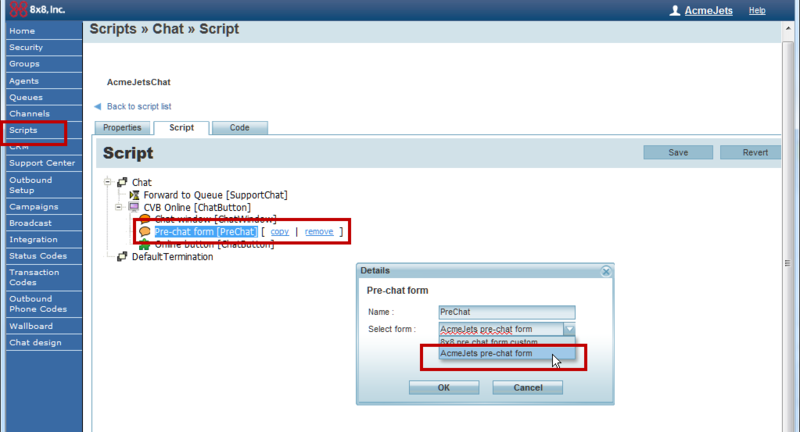 Configure a pre-chat form in the embedded chat flow. Offer language choice for customers in the pre-chat form. Include the pre-chat form in the chat script that controls the chat flow. 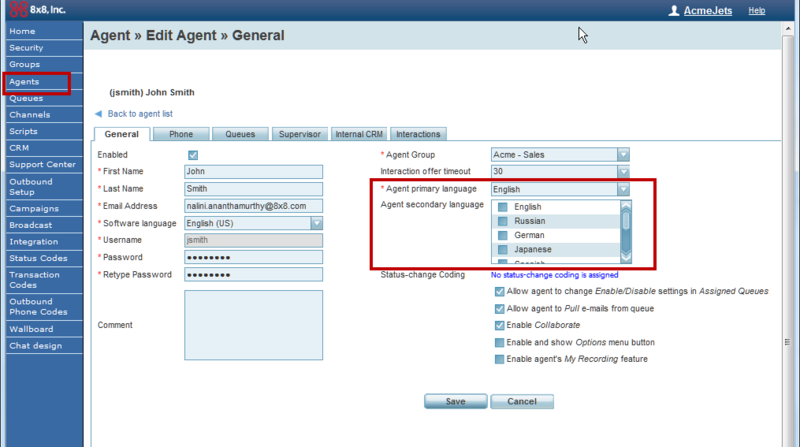 Indicate primary and secondary languages of agents. Step 1: Configure a pre-chat form to offer language choice. 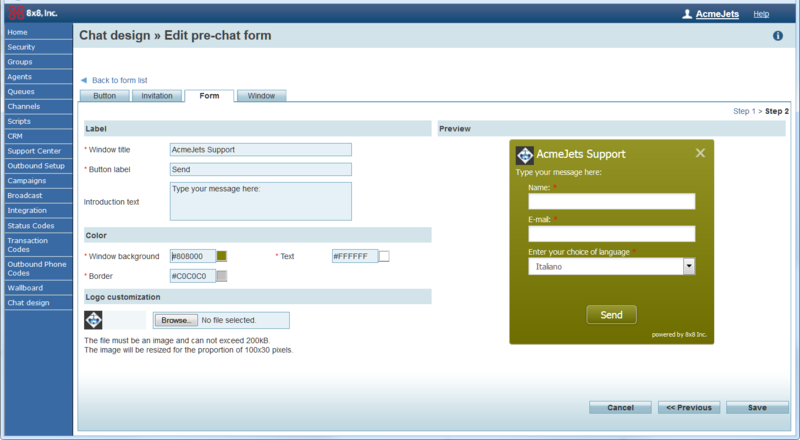 In your embedded chat flow, you must add a pre-chat form which offers language choice for customers. Using this form, customers select a language to chat in. Follow the steps described here to design a pre-chat form. Select to edit an existing pre-chat form or create a new pre-chat form. For details, refer to Designing a Pre-Chat Form. From the Question Format choices, select Translation. This offers customers a language choice question. A list of languages supported for chat translation shows up. Select the language choices that you want to offer your customers to chat in. You can set a default language for translation. Enter the question such as - Select a language you wish to chat in. Click Add. The question is added to the form. Add more questions as desired. Click Next to define the visual details of the form. Add the desired visual requirements such as window title, background color, font color. Click Save. Your custom pre-chat form is now ready with the chat translation choice. Step 2: Add or edit the chat script to include pre-chat form. In this step, you must make sure the pre-chat form is included in the chat flow, which is controlled by a chat script.So, you must include a pre-chat form with the language choice in the chat script. Edit or add a chat script. For details on designing a chat script, click here. Under the CVB Online object, click [ add ]. From the menu, select the pre-chat form you just created with the chat translation option. Note:Your chat script must contain a chat button to initiate chats, a pre-chat form to indicate language choice, a chat window for typing chat messages, and a chat queue to forward the chat requests. Assign this script to the desired chat channel. Step 3: Define primary and secondary language for agents. If the language of chat request matches agent's primary language, automatic translation is disabled. If the language of chat request matches agent's secondary language, automatic translation is available but turned off. Agent can turn it on. If the language of chat request doesn't match agent's languages, automatic translation is turned on by default. Navigate to Agents in the configuration menu. Select to edit an agent. Primary Language: Select a language of primary fluency. This is the default language of chat for agents. Secondary Language: Select one or more languages of secondary fluency. If a chat request is in any of the secondary languages, they can chat in this language or use the automatic translation tool. Save the agent's language settings. A customer visiting a website initiates a chat by clicking the chat button. A pre-chat form is presented to the customer to indicate language choice. Customer fills in the form, selects a language to chat in, and submits the chat request. The request enters the chat queue in Virtual Contact Center and is offered to an agent. On receiving a chat, the control panel indicates the language of choice for the chat. On accepting the chat, agents can process the chat using their language of fluency or use the automatic translation tool. Note: Automatic translation is available only in the absence of language match or a secondary language match. In case of primary language match, automatic translation is disabled. By using the translation tool, messages from the customer are translated to agent's primary language and vice-versa.